Weird day. Hot day. When I left the library it was 111�. I have 57 shelves left in the library to do, not counting the nonfiction section. I’m back to being a little discouraged. I’ll do the best I can, and that’s that.�I’ll work on nonfiction�when school resumes, minus the Who Is/Who Was books. I created records for�those�before school ended, since they are so popular with the kids. He didn’t just jump to the conclusion that Nico ate too many cherries. 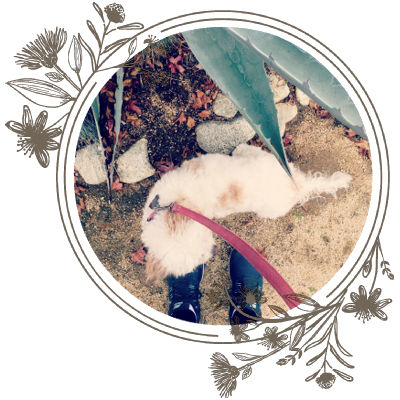 He�first considered�oral allergy syndrome, so we scratch tested him for the most common cross reacting allergens. He was positive for a number of molds and olive, but not birch, grass, or ragweed. 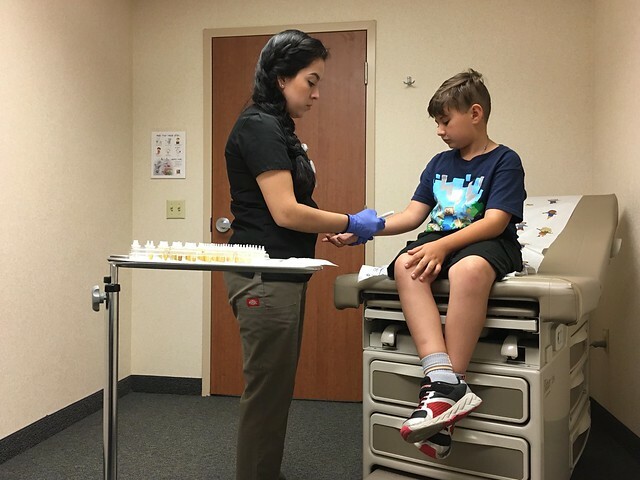 At the end of the appointment he had blood drawn to check for a rare, very unlikely, cherry allergy. I’m fine with his doctor�thinking I’m overreacting because, if I look at it objectively, it would make sense. 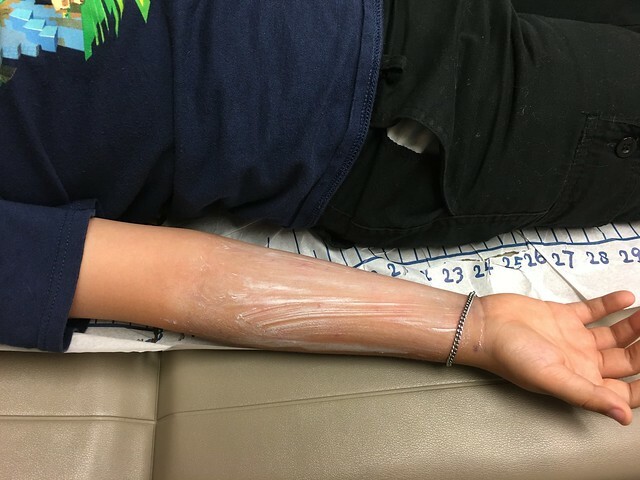 Any parent is�within their�rights to freak out if their child�goes to the hospital with a severe allergic reaction at two and eight years of age. But he still can’t tell me what happened in Lake Tahoe�other than he thinks it was a misdiagnosis, and that bothers me. 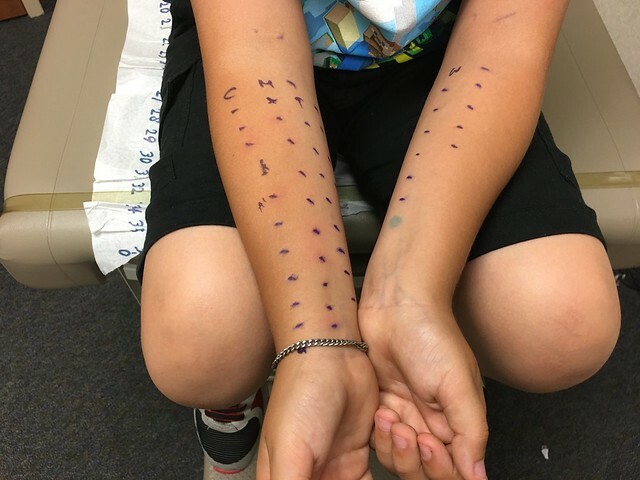 When I showed him a patch from an allergy test in April that never went away, he could only explain it as an unexplained immunological event. *The serving size is�twenty five cherries, but I’m assuming that’s for an adult. **Nico is a champ. He doesn’t complain and doesn’t let anything get him down for long. His attitude is “Oh well, won’t eat that anymore!” While I appreciate his carefree attitude and wish I was more like him, I still want to figure out what, if anything, happened last summer. I don’t want to restrict his life or take away foods if it’s not necessary, and all the blood tests now say it’s not necessary. I get your frustration with lack of definitive diagnosis. Since adolescence I’ve dealt with a litany of physical complaints. My least-favorite diagnosis? Fibromyalgia, which I think is short for: We don’t know what the F is wrong with you but we want to acknowledge that the pain is real. My sense has long been that the various issues are connected. I have no proof. I have no clear pattern of symptoms. They impact my life, but none are life-threatening. I have been advised by many, many well-meaning people to try all manner of food and lifestyle changes. I’ve actually tried quite a few. If I knew there was something that would work, I’d do it without hesitation. But so far nothing has. I know there’s nothing encouraging in what I’ve written so far. All I’ve got to offer is solidarity: You’re not Crazy Mom. There is something wrong (and unlike my situation, it does pose serious threat and that’s got to be maddening), but no one can tell you what it is. While the situation may be driving you crazy, exploring every avenue for answers and being vigilant doesn’t mean you’re crazy. It means you’re doing what all good moms do: Doing everything possible to ensure the survival of your chick. I hope you get answers soon. Thanks, Rita. How have your migraines been? The same. Up reading blogs in the middle of the night because a bad one took me down yesterday afternoon and is screwing with my sleep. Bleah. Hope you aren’t having them. I’m sorry. 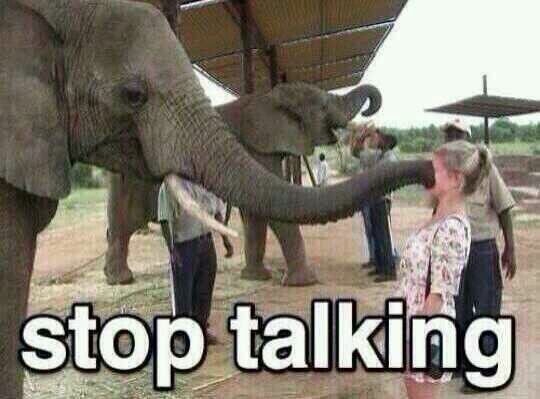 I wish you had more definitive answers. I know how frustrating it is to have allergic reactions and not be able to find the cause, but it’d be a lot harder if it was one of my kids. That has to be incredibly frustrating. Are you choosing to believe the tests, or is he still avoiding nuts? This probably doesn’t help, but my mother in law has something called allergic syndrome or something like that, where she has the signs of seasonal or environmental allergies (respiratory symptoms), but they are not tied to a particular allergen. They do treat it like an allergy, but there is nothing she can avoid or no way to predict when she will get a flare up. The human body is weird. My brother & I both had one time allergic reactions. Mine we were pretty sure was to a frozen pizza- my mom though maybe the preservatives, but it never happened again. My brother’s was to medication, but the doctor said he wasn’t allergic to it, it most likely had to do with the combination of the strain of the illness he had & the particular antibiotic reacting together. Stand you ground, Mama! If something doesn’t seem right, push for tests to give you peace of mind. When my son was a baby, we discovered he was allergic to milk. 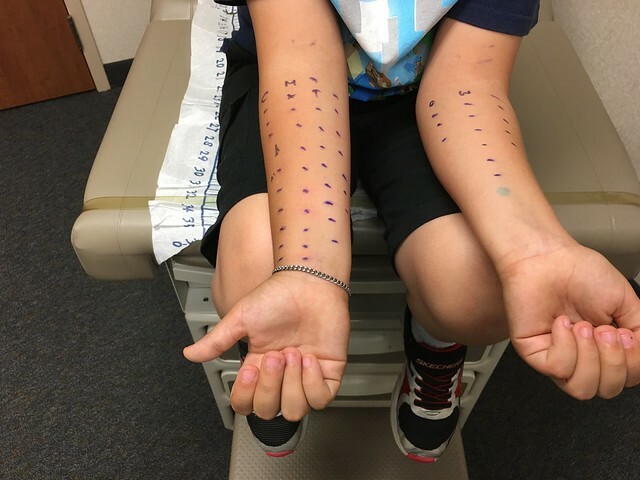 At 18 months I pushed for allergy testing because I wanted to know specifically what he was allergic to. I wasn’t pleased with the doctor telling us to just avoid dairy indefinitely. 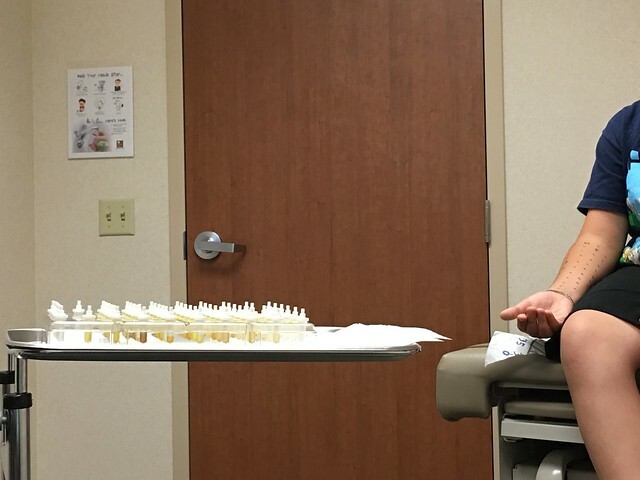 The pediatrician told me that allergy testing for toddlers is not always conclusive, but I still wanted it done. My son had the skin testing and we discovered which portion of milk he was allergic to (casein but not whey). He also had the most severe reaction to peanuts. He had never eaten peanuts in his life. I am so glad we found out this way! 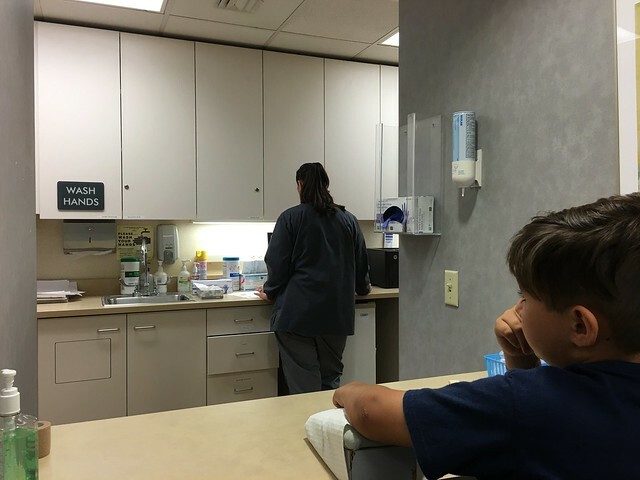 He is now 17 years old, and we have had some unfortunate incidents of exposure to peanuts which resulted in anaphylaxis and subsequent visits to the ER. What would we have done if we discovered his allergy the first time we fed him peanut butter? Thanks. I just want to know what happened in Lake Tahoe! That allergist is making me angry for you. In that situation I’d get a second opinion. 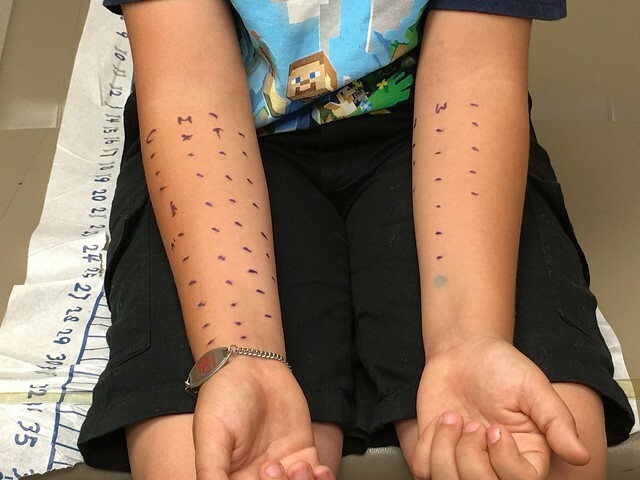 I know a second allergist won’t change the test results, but perhaps there are other options/ideas/etc. this person isn’t considering/doesn’t know about. Actually, him basically saying to rely on using the EpiPen would make me never want to see him again. They’re not 100% effective — people have died after using them — I mean, there’s a reason we get two now instead of the one we used to receive. I agree that it’s time for a second opinion. I’ve been asking around for recommendations. Trust your gut. You are a good mom. God gave you instincts for a reason. If you think you need to go to a different doctor, or you need better answers, trust that feeling.